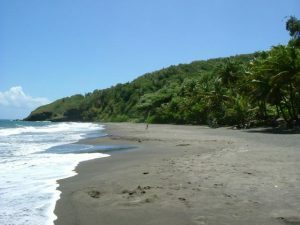 There are over 70 natural Beaches in Guadeloupe Archipelago. Some of them are so stunning that they are featuring in postcards. The typical postcard with white sand, turquoise clear water and coconut trees along the Beach. Natural Beaches in Guadeloupe Archipelago are a big asset as all of them are quite warm and protected by a system of coral reef. If you are not in the water, you will appreciate to relax on the beach shaded by almond, coconut or grape trees. 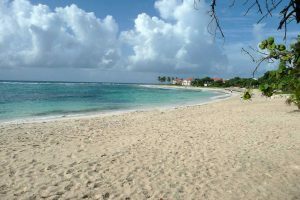 The Beaches in Guadeloupe Archipelago are quite different depending where they are located. For instance, the colours of the sand change from a beach to another. Black, dark brown, golden or white are the most common. The colours are from the multiple rocks and minerals that make up the sand. There are few Shingle Beaches even though they are less frequent than the ones with powdery sand. 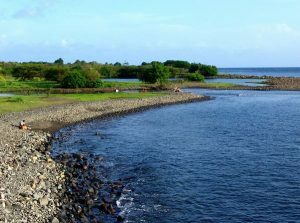 In Basse-Terrre Island, especially in the Windward Coast*, many of them are shingle or have black sand. A beach with black sand is due to volcanic eruption that occurred in the past. Eroded lava and volcanic rocks are the reason why the sand became black. *Windward Coast includes the following Townships: Basse-Terre, Baillif, Bouillante, Deshaies, Pointe-Noire and Vieux-habitants. On the other hand, Shingle Beaches are often the result of erosion of rocks offshore. Apparently, white sand is composed of tiny particles from seaweed and coral. Shingles Beaches are very young while beaches with fine sand are older. 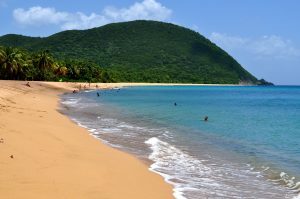 So whether you are visiting the gorgeous Beaches on the island’s Atlantic coast, where big waves crash against superb sands, or black sand Beaches of Basse-Terre Island. All of Beaches in Guadeloupe Archipelago have a lot in common including crystal-clear waters as well as an heavenly exotic environment.